Progressive gymnastics in a fun, safe & caring environment. We believe that correct gymnastics technique is the key to your child’s health, development and success. 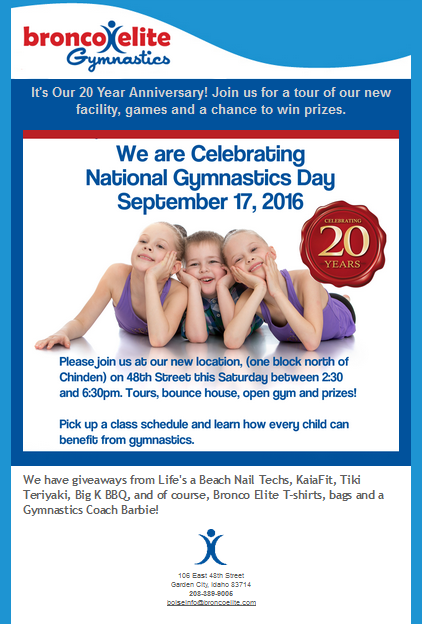 We have been teaching gymnastics to children of all ages in Boise, Idaho for over 22 years. Our caring, competent staff, low student-instructor ratio and organized, efficient lesson plans ensure that your child is constantly learning. Our classes will build your child’s strength, flexibility, coordination, balance and confidence. Special classes are also offered in Tumbling and Trampoline. Group rates are available to Idaho child-care providers and public schools. For ages 15 months and up. Click for the current class schedule and registration forms or call 208-389-9005 for more information. Developmental Gymnastic classes are for children between the ages of 15 months to about 6-7 years old. A great benefit of these classes is that they teach young children many life skills. These skills include, but are not limited to, body coordination, listening skills, direction following, interacting well with other people. These classes are also great to start your child in the right direction towards a healthy and active life style. Recreational Gymnastic Classes are for individuals from the age of about 6 and up. These classes begin to teach individuals basic gymnastics skills, strength, and flexibility. They can be a stepping stone to competitive gymnastics or just be taken for fun. We have found that gymnastics training teaches individuals discipline and hard work, and is also a great start to a healthy and active lifestyle. Our Junior Team Gymnastics Program is designed for individuals interested in competitive gymnastics and serves as preparation for Team Gymnastics. Junior Team teaches more advanced gymnastic skills, strength and flexibility and promotes discipline, hard work and self-accountability. This program is available for all ages, but participation is by invitation only. The Bronco Elite competitive gymnastics team is one of the most well respected gymnastics teams in Idaho and the Northwest Region (Region 2). We have been all-team state champions (Team of the Year) 9 times in the last 13 years: 2001, 2002, 2006, 2007, 2008, 2009, 2010, 2011, 2013 and 2015. We take pride in helping gymnasts build life long self esteem through athletic success. The Xcel Program is a new gymnastics “track” designed to offer a broad-based, affordable competitive experience outside the traditional Jr. Olympic Program to attract and retain a diverse group of athletes ages 4-17. Private gymnastics lessons are the perfect way to either introduce your child to the the sport of gymnastics or to learn or fine tune a new skill. Call 208.389.9005 for more information.